Dwight David "Ike" Eisenhower, our nation's 34th President of the United States. Eisenhower's retirement from politics. John F. Kennedy and Eisenhower walk through a gathered crowd and into an attending car. Various shots of Ike waving to crowds. 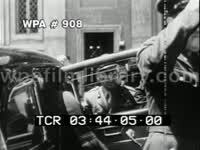 Cut to MS Mr. Truman speaking to cam, announcing Germany's surrender: "This is a solemn but glorious hour. I wish that Franklin D. Roosevelt had lived to see this day. General Eisenhower informs me that the forces of Germany have surrendered to the United Nations. The flags of freedom fly all over Europe. Much remains to be done. The victory won in the West must now be wonin the East." D-Day Invasion, VO of Eisenhower address to the people of Europe: panning LS flotilla Allied naval vessels in water, barrage balloons flying overhead; MS General OMAR BRADLEY climbing ropes, boarding ship; MS Gen. Bradley and Gen. Eisenhower meeting, talking on deck of ship; MSs Field Marshal BERNARD MONTGOMERY boarding ship, meeting w/ Gen. Eisenhower & Admiral Sir BERTRAM HOME RAMSAY. Tunisia, Africa. World War II. GV battle in the distance with smoke on the horizon. MSs of antiaircraft artillery firing. GV large explosion. GV tank rolling through thick cloud of smoke. MS Patton and other men in trench, Patton holds a pair of binoculars. GV ground artillery firing. GV explosion. MS tank firing gun. GV explosion. MSs of General Alexander meeting with General Patton. GV rural road with explosion in the distance, soldiers standing behind burm. Nice MS of Patton wearing his three star General helmet, he lifts a pair of binoculars and takes a look. Back MS of Patton and other man looking at tanks on the horizon through their binoculars. Brief GV of explosion. GV tanks rolling past camera. GV explosion. GV pan of several downed German aircraft. GV/MS/CUs of destroyed German tanks. LS London (Big Ben, Parliament, double-decker buses, etc). TLS/MSs American soldiers boarding invasion transports. MS U.S. General DWIGHT D. EISENHOWER (Ike, Dwight David Eisenhower, Eisenhower) & Lt. Gen. CARL SPAATZ arriving at camp of 101st Airborne. MSs Gen. Eisenhower speaking w/ paratroopers (502nd Parachute Infantry?) with dirty faces. MSs paratroopers donning gear, boarding C-47 transports (some wave to camera) (audio of Ike s Order of the Day speech). MS writing on nose cone of transport, "That s All, Brother!" LSs transports taking off. Transport planes in flight. MSs paratroopers on planes, hooking in, leaping. LS/MSs paratroopers landing behind enemy lines. LS paratroopers floating down and landing. LS many just coming down, (cool shot). MS paratroopers landing, being pulled by parchutes. TLS moving about, ahead. Franco watches modern fighter jets. U.S. President DWIGHT EISENHOWER (Dwight D. Eisenhower, Ike) visiting Francisco Franco, getting off Air Force plane and giving a speech from the tarmac (real audio). Franco meeting with Princess GRACE KELLY and PRINCE RAINIER of Monaco. MSs Franco playing w/ his grandkids, relaxing at home. MSs Franco and friends duck hunting; ends TLS of the men gloating over their kill, a courtyard filled with dead birds. Montage of the lavish pageantry Franco surrounded himself in. Parades, etc huge crowds gather at the events. Medieval reenactment. Aerial of the extravagant mountainside tomb he had constructed for himself. CU Eisenhower. MS's of Ike and his chiefs of staff planning in a warroom. Eisenhower in North Africa and the Europena theater. Four Star General Ike and FDR eat sandwiches in a car while discussing Operation Overlord; FDR is inside the cab while Ike is kneeling just outside it (excellent MS). Ike meets the press. Ike gets promoted to Supreme Commander of European Theater. CU of said title on a plaque on a door. MS of Ike and his chiefs of staff deliberating in a warroom. Troops and supplies moving into Europe. Ike in the field with US soldiers; inspects the men, their training, their equipment just before initiation of Operation Overlord; MS of Ike smoking a cigarette, soldiers standing around him. D-Day montage: naval armada's big guns firing on the beaches, followed by the ground storming; ends with the successful move inward, happy French villagers. Ike on parade in the capital (MS's and LS's from both behind and in front of the open convertible Ike is riding in); he waves and smiles to the exuberant crowds. MS of Ike and Mayor Laguardia standing, talking, smiling, then tight LS of a large crowd; Ike speaks to the happy NYC crowd (includes real audio). Ike, retired from the armed services, becomes president of Columbia University (tight LS of Ike on the steps of the administrative building. Ike, in CU, speaks to the camera about how and why he is keeping away from partisan politics (includes real audio). 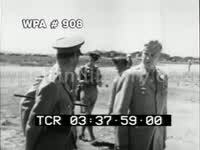 Ike in the field with NATO chiefs, 1948, one of the last times he's seen in uniform. 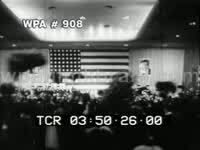 Ike takes up the campaign for the presidency of the US; he addresses an outdoor MidWestern crowd; it's a standard "what I'm going to do is different, once I'm elected" type of speech (includes real audio). Wide LS of a pro-Ike crowd (banners and placards and buttons and so on). MS of Ike and Nixon, jubilant, indoors, at a podium, standing with their wives. Tight LS of Ike meeting outside undisclosed area with Sioux Indians. 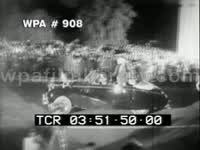 Montage of Ike at public events (propounding the everyone-likes-Ike vibe); lots of crowd shots at both day and night, at public and rather intimate events; excellent tight LS of several kids happily chasing after the camera which is dollying out at a good rate of speed. 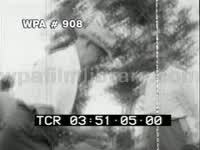 Tight LS of Ike teeing off during a Colorado vacation, the press eagerly snapping away (includes a CU of a smiling Ike, a 3W slung over his shoulder). Ike has a heart attack; montage of a press conference, a jittery press, Ike in a wheelchair on a sunny patio, his announcement for re-election (no real audio). Winning 1956 elections. 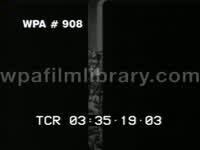 Sputnik 1 is launched by the Soviets; montage of the rocket carrying the satellite being launched, newspaper headlines, tight LS of scientists manning computer stations monitoring liftoff. Wide LS of Ike on White House front lawn practicing his driving and putting. 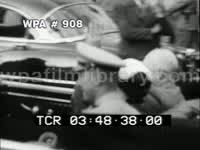 Khrushchev arrives in Washington. Press photos of the two world leaders at the White House. Various shots of Eisenhower on a goodwill tour around the world. The U2 spy plane crisis. Shots of plane taking off. Khrushchev speaking. Ike walking on WHite House lawn. CU of Ike. Bombs stowed on cart train, being transported along tarmac, past U.S. B-24 Liberator; TLS U.S. Army General Dwight Eisenhower (Dwight D. Eisenhower, Dwight David Eisenhower, Ike) smoking cigarette, talking with U.S. Army Air Force General Carl Spaatz (Carl A. Spaatz), standing on tarmac. Lt. General James Doolittle (James H. Doolittle) talking on tarmac. US Lt. General William Kepner (Bill Kepner, William E. Kepner) posing. Speeches of Dwight D. Eisenhower (Ike, Dwight Eisenhower, Dwight David Eisenhower) CU General of the Armies Eisenhower commenting on the likelihood of his entering American politics: "I can repeat only what I have said so often before, I intend to have nothing whatsoever to do with partisan politics. I will never seek political office. Moreover it is my conviction that a man who has spent his life in the professional military service should never enter partisain politicas an seek an office." MSs Dwight and Mamie Eisenhower vesting their new grandchild in hospital. MSs Dwight holding, posing w/ grandkids. High angle LS outdoor commencement ceremony at Columbia University. MS BARBARA EISENHOWER, son MAJOR JOHN EISENHOWER & MAMIE EISENHOWER in audience. MCU U.S. Army General DWIGHT D. EISENHOWER (Ike, Dwight Eisenhower, Dwight David Eisenhower) speaking in graduate garb, "In today's struggle, no free man, no free institution can be neutral. All must be joined in a common profession, that of Democratic citizenship." VO talks about threat of communist aggression calling on Eisenhower for aid and his consequential accomplishments. TLS multinational flags flying from flagpoles (United States, Great Britain, France, New Zealand, etc). MSs General Dwight Eisenhower sitting at table with military leaders (NATO conference?). MSs General Eisenhower inspecting S.H.A.P.E. troops. MS Gen. Ike speaking with German Chancellor KONRAD ADENAUER. CU French Foreign Minister ROBERT SCHUMANN. MS Gen. Ike taking seat at desk laden with microphones; MCU Gen. Ike speaking: "We here at S.H.A.P.E., representatives of many nations, work day by day constantly w/ these intricate & difficult problems. We require faith, self-confidence, devotion, tenacity-- always tenacity." TLS/MSs Eisenhower supporters marching in New Hampshire. MS two white men unfurling banner: "We Like Ike!" MS young Caucasian woman wearing dress marked by numerous Ike buttons, standing atop car with sign: "America Needs Eisenhower." MS several daily newspapers relaying national support for Ike for President, one reading, "Ike Stuns Foes." MSs General Dwight Eisenhower with Senator HENRY CABOT LODGE JR. (R-MA). MS Dwight & MAMIE EISENHOWER shaking hands, speaking to Lord LOUIS MOUNTBATTEN. MS Eisenhowers alighting plane for his farewell from SHAPE ceremony; MCU General Eisenhower saluting; MS Gen. Ike speaking: "Comrades in arms & my friends. The uniformed services of the United States are far too deeply imbedded in my heart for me ever to say a final goodbye. I hope you will allow me to say, Until we meet again." TLS train pulling into train station at Abilene, Kansas, large crowd gathered to welcome Ike home; MS citizen Ike waving, getting off train; TLS Mr. DWIGHT D. EISENHOWER (Ike, Dwight Eisenhower, Dwight David Eisenhower) & MAMIE EISENHOWER (Mrs. Eisenhower) walking through crowd, toward cam; CU Ike speaking: "Ladies & gentlemen, I believe we can have peace w/ honor, reasonable security w/ national solvency. I believe in the future of the United States of America." Use catalog # 233761 for complete record. 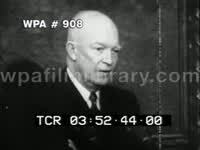 Speeches of Dwight D. Eisenhower (Ike, Dwight Eisenhower, Dwight David Eisenhower) CU/MSs Dwight Eisenhower speaking to camera: "A soldier learns as a nations must learn that integrity backed by strength is the only sure way to lasting peace. Our country's destiny, to my mind, is to serve mankind through leadership in the arts of peace. If we believe in our own system, if we allow no taint of false doctrine to confuse it. If we practice what we preach; if we provide upright leadership. We can help show the world the folly of war. With all the strength I can command & the devotion I hold for my country, I pledge myself to this objective." Use catalog # 25954 Speeches of Eisenhower. 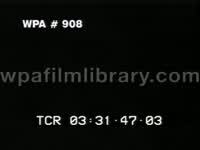 Universal Newsreel stories. TLS U.S. President DWIGHT D. EISENHOWER (Ike, Dwight Eisenhower, Dwight David Eisenhower) standing at podium, coffin draped in American flag and contained body of Unknown Soldier, two white male soldiers stepping forward w/medals: "On behalf of a grateful people I now present Medals of Honor to these two unknowns who gave their lives for the United States of America." President Eisenhower sets medals on coffins. TLS crowd gathered at Arlington National Cemetery. LS/MSs honor guard carrying coffins. VO talks of the thousands killed in World War II. (Tomb for the Unknown soldiers of WWII) TLS remains being interred. Speeches of Eisenhower. 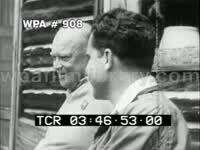 (Ike, Dwight Eisenhower, Dwight David Eisenhower) Excerpts from President's News Conference Universal Newsreel. 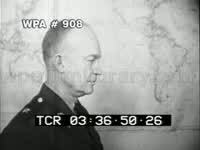 TLS/MSs U.S. President DWIGHT D. EISENHOWER speaking about the Francis Powers spy case at White House press conference. "No one wants another Pearl Harbor. This means that we must have knowledge of military forces and preparations around the world, especially those capable of massive surprise attacks. Secrecy in the Soviet Union makes this essential. In most of the world no large-scale attack could be prepared in secret, but in the Soviet Union there is a fetish of secrecy and concealment. This is a major cause of international tension and uneasiness today. Our deterrent must never be placed in jeopardy. The safety of the whole free world demands this." edit "We prefer and work for a different kind of world, and a different way of obtaining the information essential to confidence and effective deterrents. Open societies, in the day of present weapons, are the only answer. 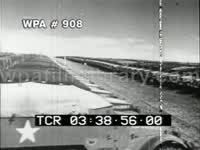 This was the reason for my "open skies" proposal in 1955, which I was ready instantly to put into effect, to permit aerial observation over the United States and the Soviet Union which would assure that no surprise attack was being prepared against anyone. I shall bring up the open skies proposal again at Paris, since it is a means of ending concealment and suspicion." Speeches of Eisenhower. (Ike, Dwight Eisenhower, Dwight David Eisenhower) MS President David Eisenhower speaking at rally: "I have worked with and have confidence in Senator Nixon." High angle LS seated crowd applauding. Speeches of Eisenhower. (Ike, Dwight Eisenhower, Dwight David Eisenhower) Excerpts from President's News Conference MS U.S. President Dwight Eisenhower speaking at last White House press conference. "I came this morning not with any particularly brilliant ideas about the future, but I did want the opportunity to say goodbye to people that I have been associated with now for 8 years, mostly I think on a friendly basis [laughter] and at least it certainly has always been interesting." WWII: Several LS/GV/MCU General Eisenhower inspecting & talking to paratroopers prior to D-Day invasion. D-Day invasion: Several GVs of battleships firing guns. GV troop boats on the water. LSs troops in landing crafts, explosions happening in water around them. TLS from troop ship as soldiers file off boat & wade onto shore. 1953 presidential inauguration: Continuous MS Dwight D. Eisenhower being sworn in, shaking hands with Harry S. Truman then his Vice President Richard Nixon. Dwight D. Eisenhower montage. Shots during World War II and after election as President. 1932 march on Washington DC by WWI veterans in protest of a bonus paycheck ( Bonus Army ) the government promised but never delivered. Ike and Macarthur clear them out (a few good shots of the two). MS East portico of the capitol building, man at podium chewing gum, looking around, turning around to look at something. TLS/pan men & women congregating, coming down steps, greeting each other, taking off hats, some U.S. military personnel, standing around, bleachers. MS U.S. National emblem (bald eagle holding arrows & olive branch). TLS exterior, people waiting HARRY S. TRUMAN to come through doorway. TLS Harry S. Truman in coat & top hat, coming down steps toward podium, removes hat. TLS RICHARD MILHOUS NIXON & some men coming down steps toward podium, stops, shake hands. 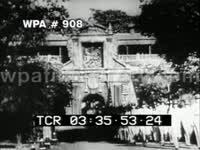 TLS DWIGHT DAVID EISENHOWER steps out of doorway, pauses, places top hat over heart & begins down steps, crowd behind. MS Richard M. Nixon behind podium, places hand on bible and takes oath of office for vice-president, shakes hands. MS/pan Dwight D. Eisenhower taking the oath of presidential office from Chief Justice FREDERICK VINSON, shakes hands, steps out of view, approaches podium. Eisenhower places hands above head in celebration, those behind him sit, puts glasses on to prayer for the world. "My Friends, before I begin the expression of those thoughts that I deem appropriate to this moment, would you permit me the privilege of uttering a little private prayer of my own. And I ask that you bow your heads: Almighty God, as we stand here at this moment my future associates in the Executive branch of Government join me in beseeching that Thou will make full and complete our dedication to the service of the people in this throng, and their fellow citizens everywhere. Give us, we pray, the power to discern clearly right from wrong, and allow all our words and actions to be governed thereby, and by the laws of this land. Especially we pray that our concern shall be for all the people regardless of station, race or calling. May cooperation be permitted and be the mutual aim of those who, under the concepts of our Constitution, hold to differing political faiths; so that all may work for the good of our beloved country and Thy glory. Amen." MS Dwight D. Eisenhower giving inaugural address. "My fellow citizens: The world and we have passed the midway point of a century of continuing challenge. We sense with all our faculties that forces of good and evil are massed and armed and opposed as rarely before in history." 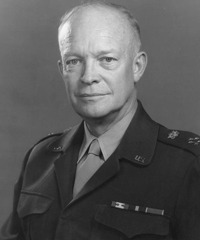 Eisenhower, " ... to inflict evil surpasses the brightest hopes and the sharpest fears of all ages. We can turn rivers in their courses, level mountains to the plains. Oceans and land and sky are avenues for our colossal commerce. Disease diminishes and life lengthens. Yet the promise of this life is imperiled by the very genius that has made it possible. Nations amass wealth. Labor sweats to create and turns out devices to level not only mountains but also cities. Science seems ready to confer upon us, as its final gift, the power to erase human life from this planet. At such a time in history, we who are free must proclaim anew our faith. This faith is the abiding creed of our fathers. It is our faith in the deathless dignity of man, governed by eternal moral and natural laws. This faith defines our full view of life." MS Dwight D. Eisenhower giving inaugural address. " ... magic of free labor and capital, nothing lies safely beyond the reach of this struggle. Freedom is pitted against slavery; lightness against the dark. The faith we hold belongs not to us alone but to the free of all the world. This common bond binds the grower of rice in Burma and the planter of wheat in Iowa, the shepherd in southern Italy and the mountaineer in the Andes. It confers a common dignity upon the French soldier who dies in Indo-China, the British soldier killed in Malaya, the American life given in Korea. We know, beyond this, that we are linked to all free peoples not merely by a noble idea but by a simple need. No free people can for long cling to any privilege or enjoy any safety in economic solitude. For all our own material might, even we need markets in the world for the surpluses of our farms and our factories. Equally, we need for these same farms and factories vital materials and products of distant lands. This basic law of interdependence, so manifest in the commerce of peace, applies with thousand-fold intensity in the event of war. So we are persuaded by necessity and by belief that the strength of all free peoples lies in unity; their danger, in discord. To produce this unity, to meet the challenge of our time, destiny has laid upon our country the responsibility of the free world's leadership. So it is proper that we assure our friends once again that, in the discharge of this responsibility, we Americans know and we observe the difference between world leadership and imperialism; between firmness and truculence; between a thoughtfully calculated goal and spasmodic reaction to the stimulus of emergencies. 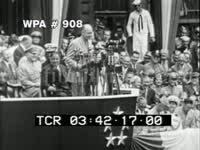 We wish our friends the world over to know this ..."
MS Dwight D. Eisenhower giving inaugural address. "... by which every participating nation will prove good faith in carrying out its pledge. 2. Realizing that common sense and common decency alike dictate the futility of appeasement, we shall never try to placate an aggressor by the false and wicked bargain of trading honor for security. Americans, indeed, all free men, remember that in the final choice a soldier's pack is not so heavy a burden as a prisoner's chains." Eisenhower, " 5. Assessing realistically the needs and capacities of proven friends of freedom, we shall strive to help them to achieve their own security and well-being. Likewise, we shall count upon them to assume, within the limits of their resources, their full and just burdens in the common defense of freedom. (edit) ... the impoverishment of any single people in the world means danger to the well-being of all other peoples. 7. Appreciating that economic need ... (edit) ...with the different problems of different areas. In the Western Hemisphere, we enthusiastically join with all our neighbors in the work of perfecting a community of fraternal trust and common purpose. In Europe, we ask that enlightened and inspired leaders of the Western nations strive with renewed vigor to make the unity of their peoples a reality. Only as free Europe unitedly marshals its strength can it effectively safeguard, even with our help, its spiritual and cultural heritage. 8. Conceiving the defense of freedom, like freedom itself, to be one and indivisible, we hold all continents and peoples in equal regard and honor. We reject any insinuation that one race or another, one people or another, is in any sense inferior or expendable." (edit) "By these rules of conduct, we hope to be known to all peoples. By their observance, an earth of peace ... "
MS Dwight D. Eisenhower giving inaugural address, "We must be ready to dare all for our country. For history does not long entrust the care of freedom to the weak or the timid. We must acquire proficiency in defense and display stamina in purpose. We must be willing, individually and as a Nation, to accept whatever sacrifices may be required of us. A people that values its privileges above its principles soon loses both. These basic ... (edit) ... the wealth of our soil to the genius of our scientists. And so each citizen plays an indispensable role. The productivity of our heads, our hands... (edit) ...to bring to pass in the world must first come to pass in the heart of America. The peace we seek, then, is nothing less than the practice and fulfillment of our whole faith among ourselves and in our dealings with others. This signifies more than the stilling of guns, easing the sorrow of war. More than escape from death, it is a way of life. More than a haven for the weary, it is a hope for the brave. This is the hope that beckons us onward in this century of trial. This is the work that awaits us all, to be done with bravery, with charity, and with prayer to Almighty God. My citizens I thank you." 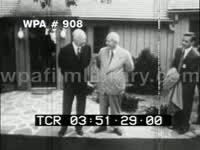 Eisenhower shaking hands. MS/pan Marine band playing, "Star Spangled Banner" to National Emblem above Portico of the capitol building & tilt down to Eisenhower & Truman, then crowd. MS/pan Eisenhower smiling. CU National Emblem. Eisenhower Funeral: Washington DC: GV procession with men of the armed forces carrying Dwight D. Eisenhower's flag draped casket. MS pan of foreign dignitaries, US politicians & Eisenhower family in attendance. TLS people at the ceremony. Abilene, Kansas: MS funeral procession through the street. MCU men of the armed forces carrying Dwight D. Eisenhower's flag draped casket. LS people of Abilene gathered to say farewell to Ike. GV pan 21 gun salute. American flag at half-staff with title reading "Dwight D. Eisenhower 1890-1969". Death of Dwight D. Eisenhower: GV Eisenhower funeral procession through the street, men of the armed forces following behind hearse. Eisenhower Funeral: MS funeral procession with men of the armed forces carrying Dwight D. Eisenhower flag draped casket.